Makerspace for Education offers educators a hands-on, creative, user-friendly, “anytime, anyplace” professional development resource that they can tap into as part of a community of practice. In a series aimed at closing the gap between research and practice, Usable Knowledge at the Harvard Graduate School of Education (HGSE) partnered with Digital Promise on a project that collects questions from educators across the country and poses them to experts at HGSE. The Global Schools Network (GSN), powered by the Partnership for 21st Century Schools (P21), officially launched on July 30, 2018. Schools from around the world may apply to join this global network focused on global competence, global awareness, linguistic competence, and a curriculum enriched by the United Nations Sustainable Development Goals. The goal of effective teachers is to maximize their students’ engagement, creating a positive and inclusive learning environment while establishing a culture of continuous education in their classrooms. 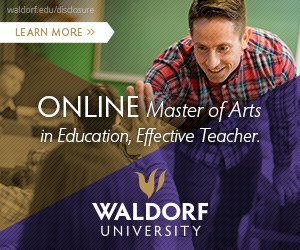 Waldorf University online programs give teachers the competitive edge they need to pursue careers as counselors, education administration professionals, and special curriculum specialists. The Master of Arts in education, effective teacher program is designed to help working education professionals bolster their teaching efficiency, refine their leadership skills, and grow their potential in the education field. Waldorf’s Master of Arts in organizational leadership develops students’ leadership skills and equips students to use those skills as instruments for organizational change within the education industry.